The Pineapple has gone for framing! I believe that several people have wanted to see the finished pineapple. Today I took it for framing and very soon it will be out of my hands! But, apart from teaching botanical art classes and workshops, I have started the small pictures that I will be giving to my nursing reunion friends in May. I don’t think that any of them follow this blog so I don’t have to worry that they will see the pictures in advance. They might not be particularly interested in botanical art, but hopefully I will be able to change their minds with the pictures. I’m just hoping that I haven’t bit off more than I can chew. It is going slower than I wanted, but I still want the pictures to be done properly. 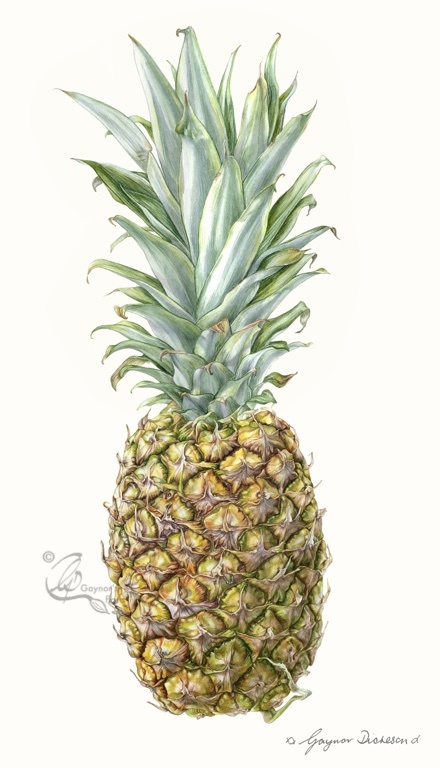 Whilst painting the pineapple, I had my camera on and hopefully in due course I will be able to post a video or two showing my technique. But that will definitely not be just yet. In the meantime – the pineapple. I hope you approve. < Last two ‘pineapple in progress’ pictures. Thank you. I’m glad you like the finished product. Just beautiful. Do you sell prints of your work? Well thank you very much. Yes I do sell limited edition prints of my work, so if you are interested do let me know. My email address is gaynorsflora@mac.com. So pleased to see it at last, it’s beautiful. Good luck with the little pictures! Thank you Joan. Hope you are good! Approval in full! It’s beautiful. Impressive. It’s brilliant Gaynor! They are so awesomely tricky to do aren’t they?! You must be pleased. I especially like your leaves- they really flow. Yes it is a tricky thing. The funny thing is that it was strange planning and trying out the segments before I started on them. But when I went over to the leaves it was like starting a different painting and I had to get into the mindset. A funny experience.